This article is about the men's football club. For the women's football club, see Norwich City L.F.C. For other uses, see Norwich City (disambiguation). 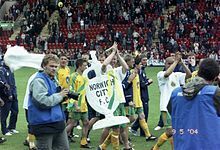 Norwich City Football Club (also known as The Canaries or City) is an English professional football club based in Norwich, Norfolk. The club currently participate in the Championship, the second tier of English football, having been relegated from the Premier League in 2016. They were first promoted to the top flight in 1972. Norwich have won the League Cup twice, in 1962 and 1985. The club has never won the top flight, but finished third in 1993. The club was founded in 1902. Since 1935, Norwich have played their home games at Carrow Road and have a long-standing and fierce rivalry with East Anglian rivals Ipswich Town, with whom they have contested the East Anglian derby 134 times since 1902. The fans' song "On the Ball, City" is regarded as being the oldest football song in the world which is still in use. The club participate in characteristic yellow and green kits and are nicknamed The Canaries after the history of breeding the birds in the area. Main article: History of Norwich City F.C. Norwich City F.C. was formed following a meeting at the Criterion Cafe in Norwich on 17 June 1902 and played their first competitive match against Harwich & Parkeston, at Newmarket Road on 6 September 1902. They joined the Norfolk & Suffolk League for the 1902–03 season, but following a FA Commission, the club was ousted from the amateur game in 1905, deemed a professional organisation. Later that year Norwich were elected to play in the Southern League and with increasing crowds, they were forced to leave Newmarket Road in 1908, moving to The Nest, a disused chalk pit. The club's original nickname was the Citizens, although this was superseded by 1907 by the more familiar Canaries after the club's chairman (who was a keen breeder of canaries) dubbed his boys 'The Canaries' and changing their strip to yellow and green. During the First World War, with football suspended and facing spiralling debts, City went into voluntary liquidation on 10 December 1917. The club was officially reformed on 15 February 1919 – a key figure in the events was Charles Frederick Watling, future Lord Mayor of Norwich and the father of future club chairman, Geoffrey Watling. When, in May 1920, the Football League formed a third Division, Norwich joined the Third Division for the following season. Their first league fixture, against Plymouth Argyle, on 28 August 1920, ended in a 1–1 draw. The club went on to endure a mediocre decade, finishing no higher than eighth but no lower than 18th. The following decade proved more successful for the club with a club-record victory, 10–2, over Coventry City and promotion as champions to the Second Division in the 1933–34 season under the management of Tom Parker. With crowds continuing to rise, and with the Football Association raising concerns over the suitability of The Nest, the club considered renovation of the ground, but ultimately decided on a move to Carrow Road. The inaugural match, held on 31 August 1935, against West Ham United, ended in a 4–3 victory to the home team and set a new record attendance of 29,779. The biggest highlight of the following four seasons was the visit of King George VI to Carrow Road on 29 October 1938. However, the club was relegated to the Third Division at the end of the season. The league was suspended the following season as a result of the outbreak of the Second World War and did not resume until the 1946–47 season. City finished this and the following season in 21st place, the poor results forcing the club to apply for re-election to the league. The club narrowly missed out on promotion under the guidance of manager Norman Low in the early 1950s, but following the return of Tom Parker as manager, Norwich finished bottom of the football league in the 1956–57 season. The 1958–59 season saw Norwich reach the semi-final of the FA Cup as a Third Division side, defeating two First Division sides on the way: Tottenham Hotspur and Matt Busby's Manchester United. In the 1959–60 season, Norwich were promoted to the Second Division after finishing second to Southampton, and achieved a fourth-place finish in the 1960–61 season. In 1962 Ron Ashman guided Norwich to their first trophy, defeating Rochdale 4–0 on aggregate in a two-legged final to win the League Cup. Sixth place in the league was the closest the club came to promotion to the First Division again during the 1960s, but after winning the division in the 1971–72 season under manager Ron Saunders, Norwich City reached the highest level of English football for the first time. They made their first appearance at Wembley Stadium in 1973, losing the League Cup final 1–0 to Tottenham Hotspur. Relegation to the Second Division in 1974 came after Saunders had departed and been succeeded by John Bond, but the board of directors kept faith in Bond and were quickly rewarded. A highly successful first season saw promotion back to the First Division and another visit to Wembley, again in the League Cup final, this time losing 1–0 to Aston Villa. Bond departed to Manchester City in the autumn of 1980 and the club were relegated six months later, but bounced back the following season after finishing third under Bond's successor Ken Brown. Norwich had also been the beneficiaries of one of English football's first million-pound transfers when they sold striker Justin Fashanu to Nottingham Forest in August 1981. The 1984–85 season was of mixed fortunes for the club; under Ken Brown's guidance, they reached the final of the Football League Cup at Wembley Stadium, having defeated Ipswich Town in the semi-final. In the final, they beat Sunderland 1–0, but in the league both Norwich and Sunderland were relegated to the second tier of English football. This made Norwich the first English club to win a major trophy and suffer relegation in the same season; something which was not matched until Birmingham City also suffered relegation the season they won the League Cup 26 years later. Norwich were also denied their first foray into Europe with the ban on English clubs after the Heysel Stadium disaster. City bounced back to the top flight by winning the Second Division championship in the 1985–86 season. This was the start of what remains in 2017 a club-record nine consecutive seasons in the top division of English football. High league placings in the First Division in 1986–87 and 1988–89 would have been enough for UEFA Cup qualification, but the ban on English clubs remained. They also had good cup runs during this period, reaching the FA Cup semi-finals in 1989 and again in 1992. During 1992–93, the inaugural season of the Premier League, Norwich City quickly emerged as surprise title contenders, before faltering in the final weeks to finish third behind the champions, Manchester United, and runners-up Aston Villa. Their top scorer that season was Mark Robins, who had been signed from Manchester United the previous summer. The following season Norwich participated in the UEFA Cup for the first (and only) time, losing in the third round to Inter Milan, but defeating Bayern Munich. Winning 2–1, Norwich were the first British team to beat Bayern Munich in the Olympic Stadium.Mike Walker quit as Norwich City manager in January 1994, to take charge of Everton and was replaced by 36-year-old first team coach John Deehan who led the club to 12th place in the 1993–94 season in the Premier League. Norwich began the 1994–95 season well, despite the pre-season loss of top scorer Chris Sutton to Blackburn Rovers for a national record £5million, and by Christmas they were seventh in the league and a UEFA Cup place was a realistic possibility. However, Norwich then went into freefall, won only one of their final 20 league games and slumped to 20th place and relegation, ending a nine-season run in the top flight. Shortly before relegation, Deehan resigned as manager and his assistant Gary Megson took over until the end of the season.Martin O'Neill, who had taken Wycombe Wanderers from the Conference to the Second Division with successive promotions, was appointed as Norwich City manager in the summer of 1995. He lasted just six months in the job before resigning after a dispute with chairman Robert Chase over money to strengthen the squad. Soon after, Chase stepped down after protests from supporters, who complained that he kept selling the club's best players and was to blame for their relegation. Chase's majority stakeholding was bought by Geoffrey Watling. English television cook Delia Smith and husband Michael Wynn-Jones took over the majority of Norwich City's shares from Watling in 1996, and Mike Walker was re-appointed as the club's manager. He was unable to repeat the success achieved during his first spell and was sacked two seasons later with Norwich mid-table in Division One.Nigel Worthington took over as Norwich City manager in December 2000 following an unsuccessful two years for the club under Bruce Rioch and then Bryan Hamilton. He had been on the coaching staff under Hamilton who resigned with the club 20th in the First Division and in real danger of relegation to the third tier of English football for the first time since the 1960s. Worthington avoided the threat of relegation and, the following season, led City to a playoff final at the Millennium Stadium, which Norwich lost against Birmingham City on penalties. The 2003–04 campaign saw the club win the First Division title, finishing eight points clear of second-placed West Bromwich Albion and returned to the top flight for the first time since 1995. For much of the 2004–05 season however, the club struggled and, despite beating Manchester United 2–0 towards the end of the season, a last day 6–0 defeat away to Fulham condemned them to relegation. The club finished in ninth place in The Championship in the 2005–06 season and, as results in the 2006–07 season went against City, manager Nigel Worthington was sacked in October 2006, directly after a 4–1 defeat by Burnley. On 16 October 2006, Norwich revealed that former City player Peter Grant had left West Ham United to become the new manager, and in February 2007, Grant replaced assistant Doug Livermore with his fellow Scot, Jim Duffy. Grant's side struggled for most of the season and made a poor start to the 2007–08 season, with only two wins by mid October; following a 1–0 defeat at fellow-strugglers Queens Park Rangers, Grant left the club by "mutual consent" on 9 October 2007. On 30 October 2007, former Newcastle United manager Glenn Roeder was confirmed as Grant's replacement. Roeder kept Norwich in the Championship with a 3–0 win over Queens Park Rangers, Norwich's penultimate game of the season. On 14 January 2009 it was announced that Roeder had been relieved of his first team duties after 60 games in charge, and just 20 victories. A week later, Bryan Gunn was appointed as manager until the end of the season, but he was unable to prevent the club from being relegated on 3 May 2009, after a 4–2 defeat away at already relegated Charlton Athletic. Following their relegation, their first game of the season resulted in a shock 7–1 home defeat against East Anglian rivals Colchester United. This was the club's heaviest ever home defeat, succeeding a record that had stood since 1946. Two fans entered the pitch and ripped up their season tickets after just 22 minutes when the team were already 4–0 down, and Gunn was sacked six days later. On 18 August 2009, Paul Lambert was announced as the new manager, leaving his post at Colchester, and nine months later led Norwich to promotion back to the Championship as League One Champions, after a single season in League One. The following season saw Norwich promoted to the Premier League, finishing second in the table behind QPR and completing the first back-to-back promotions from the 3rd tier to the 1st since Manchester City in 2000. The club finished in 12th place in their first season back in the Premier League. Manager Paul Lambert resigned within a month of the season's close to take up the vacant managerial spot at league rivals Aston Villa, and was replaced by Chris Hughton. The 2012–13 season started poorly with a 5–0 defeat to Fulham and a bad run of form that was followed by a club record unbeaten run in the Premier League. A 1–0 home defeat to Luton Town on 26 January 2013 resulted in Norwich becoming the first English top-flight team to lose a FA Cup tie to a non-league side in 24 years. Norwich secured their third year in the Premier League with consecutive victories in the last two games of the season, to finish 11th in the league. However they were relegated back to the Championship after finishing 18th in the 2013–14 season. After a mediocre first half of the 2014–15 season, Neil Adams resigned which paved the way for the appointment of then Hamilton Academical manager Alex Neil in January 2015. The appointment reinvigorated Norwich's season and after narrowly missing out on automatic promotion back to the Premier League, victory in the 2015 Championship playoff final secured an immediate return to the top division of English football. This was only temporary relief, however, as at the end of the next season they were relegated again to play season 2016/17 in the Football League Championship. The following season started successfully, with the club sitting top of the Championship in mid October. However, a poor run of form and results followed, which included five consecutive defeats, and saw the team slide to as low as twelfth in the table. On 10 March 2017, Alex Neil was sacked by the club, with first team coach Alan Irvine placed in caretaker charge for the remainder of the season, which saw the club finish eighth in the Championship. On 25 May 2017, the club appointed German coach Daniel Farke as head coach, becoming the first foreign head coach of the club in its 114-year history. Norwich City's nickname, "The Canaries", has long influenced the team's colours and crest. Originally, the club was nicknamed the Citizens ("Cits" for short), and played in light blue and white halved shirts, although the halves were inconsistent; "the blue was sometimes on the left hand side of the shirt and sometimes on the right." The earliest known recorded link between the club and canaries, comes in an interview recorded in the Eastern Daily Press with newly appointed manager, John Bowman in April 1905. The paper quotes him saying "Well I knew of the City's existence... I have... heard of the canaries." "This as far as we can tell is the first time that the popular pastime of the day ie... rearing... canaries was linked with Norwich City FC... the club still played in blue and white, and would continue to do so for another two seasons." But the city of Norwich had long connections with canaries owing to its 15th and 16th century links to Flemish weavers who had imported the birds to the Low Countries from the Dutch colonies in the Caribbean. By February 1907, the nickname Canaries had come more into vogue; thoughts that an FA Cup tie against West Bromwich Albion (nicknamed "Throstles" after a bird) was "a bird -singing contest" were dismissed by the polymathC.B. Fry as "humbug" but Bowman and Fry's colleagues in the national press increasingly referred to the team as Canaries. The following season, to match the nickname, City played for the first time in Canary livery; "yellow shirts with green collars and cuffs. One paper produced the quote 'The Cits are dead but the Canaries are very much alive'." Apart from the obvious colour link, a canary may seem an odd choice; however, many English football clubs have adopted small birds as emblems that symbolise agility and deftness around the field. While the home colours of yellow and green remain to this day, the away colours have varied since introduction. For example, the away kit for the 2012–13 season was black shirts and shorts. A simple canary badge was first adopted in 1922. The current club badge consists of a canary resting on a football with a stylised version of the City of Norwicharms in the top left corner. For the club's centenary celebrations in 2002, a special crest was designed. It featured two canaries looking left and right, and a ribbon noting the centenary. Norwich City F.C. played at Newmarket Road from 1902 to 1908, with a record attendance of 10,366 against Sheffield Wednesday in a second round FA Cup match in 1908. Following a dispute over the conditions of renting the Newmarket Road ground, in 1908, the club moved to a new home in a converted disused chalk pit in Rosary Road which became known as "The Nest". By the 1930s, the ground capacity was proving insufficient for the growing crowds and in 1935 the club moved to its current home in Carrow Road. The original stadium, "the largest construction job in the city since the building of Norwich Castle... was "miraculously" built in just 82 days... it was referred to [by club officials] as 'The eighth wonder of the world'" An aerial photograph from August 1935 shows three sides of open terracing and a covered stand, with a Colman's Mustard advertisement painted on its roof, visible only from the air. Another photograph, taken on a match day that same season, shows that despite the era's limited car ownership, a parking area was provided at the ground. Floodlights were erected at the ground in 1956 whose £9,000 costs nearly sent the club into bankruptcy but the success in the 1959 FA Cup secured the financial status of the club and allowed for a cover to be built over the South Stand, which was itself replaced in 2003 when a new 7,000 seat South stand, subsequently renamed the Jarrold Stand, was built in its place. 1963 saw the record attendance for Carrow Road, with a crowd of 43,984 for a 6th round FA Cup match against Leicester City, but in the wake of the Ibrox disaster in 1971, safety licences were required by clubs which resulted in the capacity being drastically reduced to around 20,000. A two-tier terrace was built at the River End and soon after seats began to replace the terraces. By 1979 the stadium had a capacity of 28,392 with seats for 12,675. A fire in 1984 partially destroyed one of the stands which eventually led to its complete demolition and replacement by 1987 of a new City Stand, which chairman Robert Chase described as "Coming to a football match within the City Stand is very much like going to the theatre – the only difference being that our stage is covered with grass". After the Hillsborough disaster in 1989 and the subsequent outcome of the Taylor Report in 1990, the stadium was converted to all-seater with the corners being filled. Today, Carrow Road is an all-seater stadium, with a capacity of 27,244. While much of the support that the club enjoys is local, there are a number of exile fan clubs, notably in London and stretching from Scandinavia to countries further afield such as the United Arab Emirates, Bermuda, Hong Kong, Thailand, Australia and the United States. Hurrah! We've scored a goal, City! City! City! Locally, much is made of the informal title "Pride of Anglia". Fans variously claim the title for either winning the East Anglian Derby, finishing highest in the league, having the better current league position, having the more successful club history or for reasons without any apparent logical basis. The club's main local rival is Ipswich Town. When Norwich and Ipswich meet it is known as the 'East Anglian Derby', or, informally, as the 'Old Farm Derby' – a comic reference to the 'Old Firm Derby' played between Scottish teams Celtic and Rangers. Over the 134 matches played against Ipswich since 1902, Ipswich has the better record, having won 45% of the matches to Norwich's 37%. [i] Another commonly employed measure for "Pride of Anglia", and one that encompasses all of the East Anglian teams is to dub the side finishing as the highest placed East Anglian team in the Football League as the Pride of Anglia. The club also maintains a healthy celebrity support with celebrity cook Delia Smith and comedian Stephen Fry both having moved from fans of the club to running it. Actor Hugh Jackman is also a fan of the club, having been taken to Carrow Road as a child by his English mother, though he turned down an opportunity to become an investor in the club in 2010.BT Sport Presenter Jake Humphrey, who was born in Peterborough but moved to Norwich with his family at the age of nine, is another celebrity supporter. Also Sky Sports presenter Simon Thomas, who is Vice-President of the Norwich City Supporters Trust, Norfolk-born musician, model and media personality Myleene Klass, singer Sophie Ellis-Bextor, and Labour ex-politician Ed Balls. Journalist and broadcaster Sir David Frost OBE also declared his love for The Canaries during his lifetime. Norwich City FC is a public limited company that, in 2003, comprised approximately 8,000 individual shareholdings. Since purchasing their shares from Geoffrey Watling, Delia Smith and husband Michael Wynn-Jones have been joint majority shareholders. 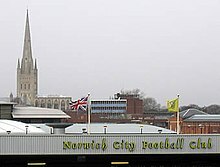 At the 2006–07 Norwich City FC Annual General Meeting (on 18 January 2007) Smith and Wynn-Jones announced that they would be open to offers to buy their majority stake-holding in the club. However, they made clear that any prospective buyer would have to invest heavily in the squad, with regards to team improving. On 8 May 2007 the football club announced that Andrew and Sharon Turner had bought out all 5,000 shares belonging to former Board member, Barry Skipper and had given the club an interest-free loan of £2m. Mr and Mrs Turner are owners and directors of personal finance company Central Trust. During July 2008 Peter Cullum declared that he was interested in a takeover of the club, and pledged that he would invest £20m for enhancement of the playing squad. On 8 July the EDP reported that Delia Smith and the board had invited Peter Cullum for talks. Reports later stated that the talks had been terminated with immediate effect, and no deal was to be reached. On 2 September 2008, Andrew and Sharon Turner announced that they were leaving the football club's board of directors. This left a £2 million hole in Norwich City's budget. On 4 September 2008, Delia Smith and Michael Wynn-Jones announced that they would be injecting £2 million, avoiding financial problems for the club. The 2011 Annual General Meeting, attended by over 500 shareholders, saw joint majority shareholder Delia Smith and Stephan Phillips re-elected as directors and new director Stephen Fry formally re-elected having joined the Board the previous August. On 27 December 2015, former Shadow ChancellorEd Balls was appointed Chairman. Kevin Keelan holds the record for Norwich appearances, having played 673 first-team matches between 1963 and 1980. Ralph Hunt holds the record for the most goals scored in a season, 31 in the 1955–56 season in Division Three (South), with Johnny Gavin the top scorer over a career – 122 between 1948 and 1955. Mark Bowen holds the club record for most international caps, with 35 for Wales. The club's widest victory margin in the league was their 10–2 win against Coventry City in the Division Three (South) in 1930. Their heaviest defeat in the league was 10–2 against Swindon Town in 1908 in the Southern Football League. Norwich's record home attendance is 43,984 for a sixth round FA Cup match against Leicester City on 30 March 1963. With the introduction of regulations enforcing all-seater stadiums, it is unlikely that this record will be beaten in the foreseeable future. The highest transfer fee received for a Norwich player is £10 million, from Southampton for Nathan Redmond in June 2016, while the most spent by the club on a player was the signing of Ricky van Wolfswinkel for £8.5 million (€10 million) from Sporting Lisbon. This transfer fee was then equaled by the signing of Steven Naismith from Everton in January 2016. The club's highest league finish was third in the FA Premier League in 1992–93. The 2015–16 season was Norwich's 25th in the top flight of English football. The club has won the League Cup twice (most recently in 1985) and reached the FA Cup semi-final three times, most recently in 1992. Norwich have taken part in European competition just once, reaching the third round of the UEFA Cup in 1993–94 and are the only British side to beat Bayern Munich in the Olympic Stadium. Between 2006 and 2008 the club was sponsored by airline Flybe but on 26 April 2008, it was announced that the company was stepping down as the main sponsor. On 29 April 2008 it was announced that Aviva which has offices in the city and is the parent company of the former Norwich Union, would be the new shirt sponsor, having signed a three-year contract. In 2009 the deal was extended until the end of the 2011–12 season. It was further extended in 2012 by four more years to the end of the 2015–16 season. During the 2016–17 season, Aviva Community Fund were Norwich's main shirt sponsor. On 26 June 2017, the club announced that Swedish mobile betting company LeoVegas would take over as their main shirt sponsor for three seasons, starting from the 2017–18 season. This article is about the American military college. For the British art school, see Norwich University of the Arts. Norwich University – The Military College of Vermont is a private university located in Northfield, Vermont. It is the oldest private military college in the United States. The university was founded in 1819 at Norwich, Vermont, as the American Literary, Scientific and Military Academy. It is the oldest of six senior military colleges, and is recognized by the United States Department of Defense as the "Birthplace of ROTC" (Reserve Officers' Training Corps). The university was founded in 1819 at Norwich, Vermont by CaptainAlden Partridge, military educator and former superintendent of West Point. Partridge believed in the "American System of Education," a traditional liberal arts curriculum with instruction in civil engineering (the first in the nation) and military science. After leaving West Point because of congressional disapproval of his system, he returned to his native state of Vermont to create the American Literary, Scientific and Military Academy. Partridge, in founding the academy, rebelled against the reforms of Sylvanus Thayer to prevent the rise of what he saw as the greatest threat to the security of the young republic: an aristocratic officer class. He believed that a well-trained militia was an urgent necessity and developed the American system around that idea. His academy became the inspiration for a number of military colleges throughout the nation, including The Citadel, and later the land grant colleges created through the Morrill Act of 1862. Today, Norwich offers substantial online distance graduate programs and is similar in many regards to The Citadel in mission, online offerings, student body composition, and size. Partridge was the founding father of ROTC and the Citizen-Soldier concept. All entering freshman entering the Corps of Cadets are called "Rooks" and their first year at Norwich is called "Rookdom". The institution of "Rookdom" consists of two three-month processes that mold civilians into Norwich Cadets: Rook Basic Training and Basic Leadership Training. Culmination of Rook Basic Training marks the halfway point toward Recognition and occurs before Thanksgiving break, after which Rooks are awarded privileges. Recognition into the Corps of Cadets typically occurs around the twenty-third week. Partridge's educational beliefs were considered radical at the time, and this led to his conflicting views with the federal government while he was the superintendent of West Point. Upon creation of his own school, he immediately incorporated classes of agriculture and modern languages in addition to the sciences, liberal arts, and various military subjects. Field exercises, for which Partridge borrowed cannon and muskets from the federal and state governments, supplemented classroom instruction and added an element of realism to the college’s program of well-rounded military education. Partridge founded six other military institutions during his quest to reform the fledgling United States military. They were the Virginia Literary, Scientific and Military Academy at Portsmouth, Virginia (1839–1846), Pennsylvania Literary, Scientific, and Military Academy at Bristol, Pennsylvania (1842–1845), Pennsylvania Military Institute at Harrisburg, Pennsylvania (1845–1848), Wilmington Literary, Scientific and Military Academy at Wilmington, Delaware (1846–1848), the Scientific and Military Collegiate Institute at Reading, Pennsylvania (1850–1854), Gymnasium and Military Institute at Pembroke, New Hampshire (1850–1853) and the National Scientific and Military Academy at Brandywine Springs, Delaware (1853). In 1825 the academy moved to Middletown, Connecticut, to provide better naval training to the school's growing corps of cadets. Beginning in 1826, the college offered the first program of courses in civil engineering in the US. In 1829, the state of Connecticut declined to grant Captain Partridge a charter and he moved the school back to Norwich (the Middletown campus became Wesleyan University in 1831). In 1834, Vermont granted a charter and recognized the institution as Norwich University. During the 1856 academic year, the first chapter of the Theta Chi Fraternity was founded by cadets Frederick Norton Freeman and Arthur Chase. With the beginning of the Civil War in 1861, Norwich cadets served as instructors of the state militias throughout the Northeast and the entire class of 1862 enlisted upon its graduation. Norwich turned out hundreds of officers and soldiers who served with the federal armies in the American Civil War, including four recipients of the Medal of Honor. One graduate led a corps, seven more headed divisions, 21 commanded brigades, 38 led regiments, and various alumni served in 131 different regimental organizations. In addition, these men were eyewitnesses to some of the war's most dramatic events, including the bloodiest day of the conflict at Antietam, the attack up Marye's Heights at Fredericksburg, and the repulse of Pickett's Charge at Gettysburg. Seven hundred and fifty Norwich men served in the Civil War, of whom sixty fought for the Confederacy. Because of the university's participation in the struggle, the number of students dwindled to seven in the class of 1864 alone. The Confederate raid on St. Albans, Vermont precipitated fear that Newport, Vermont was an imminent target. The Corps of Cadets quickly boarded an express train for Newport, the same day, October 19, 1864, to the great relief of the inhabitants. After a catastrophic fire in 1866 which devastated the Old South Barracks and the entire Military Academy, the town of Northfield welcomed the struggling school. The Civil War, the fire, and the uncertainty regarding the continuation of the University seriously lowered the attendance, and the school opened in the fall of 1866 with only 19 students. The 1870s and 1880s saw many financially turbulent times for the institution and the renaming of the school to Lewis College in 1880. In 1881, the student body was reduced to only a dozen men. By 1884, the Vermont Legislature had the name of the school changed back to Norwich. In the 1890s, the United States Army and Norwich expanded their collaboration, including the two-year appointment of career officer Jesse McI. Carter as an instructor and Commandant of Cadets. In 1898 the university was designated as the Military College of the State of Vermont. As part of the Vermont National Guard, the school's Corps of Cadets was mobilized as a squadron of cavalry in the First Vermont Regiment to assist in General John J. Pershing'sMexican Expedition. This greatly disrupted the academic year and in 1916 the War Department designated Norwich as the first site for a Senior ROTC cavalry unit; also in 1916, the first African-American, Harold "Doc" Martin (NU 1920), matriculated. Classes graduated early for both the First and Second World Wars and many Norwich-made officers saw service in all theaters of both conflicts. Professional education offered at Norwich also changed and adapted with the advance of technology. Military flight training began in 1939 and from 1946 to 1947, horse cavalry was completely phased out in favor of armored cavalry. Graduates returning from European and Pacific fields of battle found a university very different from the one they had left behind. From the late 1940s to the 1960s, Norwich was greatly expanded and added a number of new opportunities. In 1947, the Army Department created a new program uniquely suited to Vermont's harsh climate: a mountain and cold weather warfare unit. Air Force and Navy ROTC programs were established in 1972 and 1984 respectively. During the 1974 school year, the university admitted women into the Corps of Cadets, two years before the federal service academies. Although unpopular at the time, Norwich University began a social trend that would move the country closer in gender equality. The 1972 merger and 1993 integration with Vermont College added two groups to "the Hill," women and civilian students. In 2001, Norwich later sold its Vermont College campus and non-traditional degree programs to the Union Institute and University. Vermont College's arts programs were spun off as the once again independent Vermont College of Fine Arts in 2008. Prior to the 2009–2010 school year companies consisted of one upperclassmen platoon and one freshmen platoon, with each platoon consisting of three squads. The companies in the original system were Alpha, Bravo, Charlie, Delta, Echo, Foxtrot, Golf, Hotel, India, Kilo, Lima, Mike, Band, Drill Team, Military Police and Artillery. The companies Alpha through Mike were known as "line companies", and were part of Battalions 1, 2, 3 and 4. Band, Drill Team, Military Police and Artillery were placed in Provisional Battalion. Under this traditional system a cadet could spend his entire time at the school in one company. While this had the benefit of creating unique cultures and traditions in each company, and strengthened the bond each cadet had with his/her fellow "Rook Buddies" and the Corps and school at large, sometimes long-standing company traditions would lead to fraternity-like hazing and eventually challenge the authority of the Corps chain of command. In 2009, the Provisional Artillery Company was deactivated. In the nineteenth century, hazing of undergraduates by upper classmen was normal in all military schools and many non-military ones as well. Hazing diminished in the early 20th century. By the late 20th century, it became not only counter to university rules but illegal as well. Nevertheless, there were several reported instances of hazing in 1990 and 1995. In 1910 Ainsworth Hall was constructed for the United States Weather Bureau as its central Vermont station. Later returned to the university in 1948, it served as the Administrative Headquarters of the campus. By 1955, growth of the University forced the relocation of the Administration back up the hill to Dewey Hall. When also in 1955 construction began on Webb Hall to the immediate west of the building, the infirmary moved into the now empty structure. Due to expansion of the university in the 1960s and 1970s the building was converted into the home of the Division of Social Sciences. The building is named for Mrs. Laura Ainsworth, widow of Captain James E. Ainsworth (NU 1853), who in 1915 worked to bring an infirmary to campus. Chaplin Hall, originally Carnegie Hall, was built in 1907. The School of Architecture & Art is located there. Paid for by Andrew Carnegie, the building served as the university's library until 1993 with the construction of Kreitzberg Library. When the library was renovated in 1952, from the contributions of trustee Henry P. Chaplin, it was rededicated as the Henry Prescott Chaplin Memorial Library. Until 1941 and the addition of Partridge Hall to the growing campus, Chaplin Hall also provided the classrooms and offices for the Department of Electrical Engineering. This building, on the site of the first building in Center Northfield, contains the offices and classrooms of the Communications Department. The offices for the school newspaper The Guidon and the studios for the university's radio station WNUB-FM are also located in this building. The building was purchased by the university in 1973 and restored in 1988. Named for Admiral of the NavyGeorge Dewey (NU 1852–1854), and completed in 1902, Dewey Hall is one of the oldest buildings in the Northfield campus. It was originally two stories high with the lower floor occupied by offices of the university's administration, the library and museum. Office space for trustees and faculty, a chapel with a seating of five hundred and the United States Weather Bureau were located on the second floor. With the departure of the Weather Bureau in 1909 and the completion of the then new Carnegie Library in 1907, the Hall was primarily used by the Military Department. In October 1925 a fire gutted the building which led to its reconstruction as a three story structure. Dewey Hall currently houses the Division of Business & Management and a computer lab. Hollis House is today the location of a number of classrooms and offices of the College of Liberal Arts. Built in 1852, the building was until 1909 the house of a number of prominent residents of Northfield. When sold that year to the university, it became part of the US Weather Bureau's station collocated on campus. The building was later named for David B. "Dixie" Hollis (NU 1922) who upon his death in 1993 gave what was then the largest donation in the university's history: $7 million. The Engineering, Math and Science Complex houses the David Crawford School of Engineering as well as the departments of Geology, Chemistry, Physics, Biology, Mathematics and Sports Medicine. An addition of Nursing was completed in 2011. The complex (known as the "U" building) is composed of six sections: Juckett, Partridge and Tompkins Halls; the Science Building, Bartolleto Hall and the Cabot Annex. The complex was completed in 1997 and replaced a previous set of 1940s- and 1950s-era facilities. The Engineering, Math and Science Complex also contains the university's Computer Services office and the majority of the campus' independent computer labs. Kreitzberg Library is named in recognition of Barbara and Chairman of the Board of Trustees Fred Kreitzberg (NU 1957). The library has a catalog of more than 240,000 books, about 45,000 electronic journals, and a collection of federal government publications. The Norwich University Archives and Special Collections has rare books and unique source materials relating to military history, the history of Vermont, and the history of the university. The 58,000-square-foot (5,400 m2) library was designed by Perry Dean Rogers Architects. It was completed in 1993 at a cost of $8.1 million. The administration has announced that the library will go through a period of reconstruction starting in 2015, during which the building will be upgraded and a cafe will be installed on the first floor.. Completed on September 1, 2015, 77% more seating, group study rooms, an improved service desk, and other improved technologies. Webb Hall was completed in 1960 and originally housed the English, Modern Languages, Social Sciences, Business Administration and the Psychology and Education departments. The Division of Humanities and Education program are located in this building. Twenty one classrooms, three seminar rooms and a computer lab are available. Dole Auditorium, which can seat over four hundred people, is located in Webb Hall. The building is named after J. Watson Webb, a Norwich trustee. The auditorium honors Charles Dole (NU 1869), who served in his career at the university as an instructor in mathematics and Latin, a professor of history and rhetoric, the commandant of cadets and acting president of the university from 1895 to 1896. Renovated in 2017. Patterson Hall – Named for a 1909 graduate in civil engineering and a trustee. Built in 1958. Renovated in 2017. Crawford Hall – Named after David C. Crawford (1952) and after whom the School of Engineering is also named, it is the first residence hall to not be on the Upper Parade Ground and was typically reserved for traditional students. As of 2012, it housed both upperclassmen in the Corps of Cadets and civilians. Since the opening of West Hall, it solely houses cadets. Built in 1988. South Hall – It is the second dorm to be located off of the Upper Parade Ground and is reserved for traditional students. Built in 2009, it opened for the 2009–10 school year. Dalrymple Hall – The newest residence hall, completed in 2014 at a cost of $23.2 million. Tuition will rise 3% as a result of this new building. Andrews Hall, built in 1980, houses the Department of Athletics. In addition, it has basketball and racquetball courts and the equipment and athletic training rooms for the university's varsity and intramural teams. The Athletic Hall of Fame is also located in Andrews Hall. The facility honors trustee Paul R. Andrews (NU 1930). Kreitzberg Arena is home to the men’s and women’s varsity ice hockey teams, as well as the school’s club team. The armory, built in 1928, is named to honor a notable 1896 graduate of the university, Charles A. Plumley. Plumley served as the president of the university from 1930 to 1934 when he was elected to Congress as Vermont's sole representative from 1934 to 1951. The main floor of the building provides seating space for 4,000 in an area as large as three basketball courts. There is an elevated running track as well as locker rooms, training rooms, and Navy ROTC offices in the basement. Connected to the armory is Goodyear Pool. Built in 1962, the pool is a 25 x 14 yard 5 lane facility that is open to all university members. Dedicated in 1921, Sabine Field is currently home to the university football and cross country teams. Sabine field is slated for a complete renovation. The renovation will include the installation of all-weather turf, stadium lighting, new bleachers, and a state-of-the-art press box. It is designed so that lacrosse, soccer, and rugby will also be able to use the field. Shapiro Field House, built in 1987 and named for trustee Jacob Shapiro (NU 1936), houses a multipurpose arena that has a 200-meter indoor running track, four tennis courts, and a climbing wall. It is also used for morning PT (Physical Training), athletic practices, Commencement, concerts and other university functions. The Harmon Memorial is a tribute to Major GeneralErnest Harmon, who attended Norwich University from 1912 to 1913 and was later president from 1950 to 1968. Recorded on the memorial, by year of death, are the names of alumni, faculty, staff, and friends of Norwich University that have made a "significant contribution" to the university. Harmon Hall opened in 1955 and later enlarged in 1958. Since then, it has served as the focal point for student life and activities. The campus mess hall, bookstore, post office, and The Mill (a snack bar open to Corps upperclassmen and civilians) are located on the lower two floors. The Foreign Student Office, Student Activities, Yearbook Office, Music Program offices, a game room, and a lounge were located on the top floor. This floor originally housed the departments of English, History, and Modern Languages until they were moved to Webb Hall in 1960. Harmon Hall was renovated in 2007. The addition onto Harmon Hall is named the Wise Campus Center. Norwich University moved to Northfield from Norwich, Vermont, in 1866 when the South Barracks at the older location were destroyed by fire. Old Jackman Hall was the first building to be constructed at the new central Vermont site. The building was erected in 1868, and named Jackman Hall in 1907 to honor Brigadier General Alonzo Jackman (NU 1836) a faculty member, proponent of the Transatlantic telegraph cable and militia Brigadier General during the American Civil War. From its construction till 1905 the building served as housing for cadets. In the mid-1950s Jackman Hall was extensively remodeled and modernized, however, it became apparent that the almost century-old barracks were too costly to maintain. It was decided that rather than pay for near continual upkeep to build a new hall on the same site. As many newer barracks had been built since its original construction it was decided that the new Jackman Hall would serve as the primary administration building. Currently the Army and Air Force ROTC departments are also housed in Jackman Hall. Constructed by a gift from Eugene L. White (NU 1914), a trustee, the chapel was completed in 1941. Originally designed as a multi-purpose building, then White Hall has served as a mess hall with a dining room, lunch room, kitchen, a college store and a recreational room. White Hall was converted to the university's first single-purpose chapel after Harmon Hall was opened in 1955. There are two bronze plaques on the walls that honor the Norwich war dead. Weekly services include Catholic Mass on Wednesday and Sunday, non-denominational service on Sunday, and Islamic prayer on Friday. One of the newer buildings on the campus, the Sullivan Museum was opened January 22, 2007. The building is named after General Gordon R. Sullivan (ret. ), Norwich class of 1959 and former U.S. Army Chief of Staff. The Sullivan Museum houses state of the art conservation, storage, and display facilities for the wide variety of Norwich University artifacts and memorabilia. Items currently displayed cover a wide spectrum of Norwich history, including uniforms worn by Alden Partridge and Alonzo Jackman to pieces from more recent history. The university has approximately a total of 3,400 students, 2,100 undergraduate students/ 1300 graduate students, 112 full-time faculty (approximately 80% hold a doctorate), and a fluctuating number of adjunct professors. The student/faculty ratio is 14:1 and the male/female ratio is 7:1. The freshman retention rate is 80%. The student body comprises students from over 45 different states and 20 countries. As of 2011, 72.9 percent of full-time undergraduates receive some kind of need-based financial aid and the average need-based scholarship or grant award is $18,150. The university offers a number of student services including nonremedial tutoring, placement service, health service, and health insurance. Norwich University also offers campus safety and security services like 24-hour foot and vehicle patrols, 24-hour emergency telephones, and lighted pathways/sidewalks. 42% of students have cars on campus and 83% of students live on campus. Alcohol is not permitted for students of legal age at Norwich University with exception of Partridge’s Pub. More than 90% are involved in activities outside the classroom. Norwich University has two different on-campus resident programs: the traditional Corps of Cadets and a non-military student body. 63.5% of applicants to Norwich are accepted yearly. I believe that the cardinal virtues of the individual are courage, honesty, temperance and wisdom; and that the true measure of success is service rendered—to God, to Country, and to Mankind. I believe that the fundamental problem of society is to maintain a free government wherein liberty may be secured through obedience to law, and that a citizen soldiery is the cornerstone upon which such a government must rest. I believe that real education presupposes a sense of proportion in physical, mental, and moral development; and that he alone is educated who has learned the lessons of self-control and open-mindedness. I believe in Norwich, my Alma Mater, because within her halls throughout the years these tenets have found expression while men have been taught to be loyal to duly constituted authority in thought and word and deed; to view suffrage as a sacred privilege to be exercised only in accordance with the dictates of conscience; to regard public office as a public trust; and finally to fight, and if need be to die, in defense of the cherished institutions of America. Cadet officers and non-commissioned officers command the Corps of Cadets. As leaders, they are responsible for the day-to-day administration, operation, training and discipline of the Corps. Norwich is one of six senior military colleges in the country recognized by Title 10 of the U.S. Code, Section 2111a(f). This entitles eligible ROTC graduates to active duty service if they so choose. The Corps is structured as a regiment commanded by a cadet colonel (C/COL) with five battalions each commanded by a cadet lieutenant colonel (C/LTC) and a Headquarterscompany commanded by a cadet major. 1st, 2nd, and provisional battalions are composed of companies of upperclassmen commanded by a cadet captain with two or three platoons per company. 3rd and 4th Battalion are freshman training battalions and are composed of three companies of three platoons each. This structure was put in place for the 2009–2010 school year, replacing the more traditional "Original Company" system. Norwich University Corps of Cadets rank insignia follows West Point with the use of chevrons to show all cadet ranks in lieu of chevrons, disks & lozenges. Any recognized cadet defaults to the rank of private if they hold no job responsibilities in the Corps of Cadets. Norwich has 29 majors across six academic divisions with the most popular major being criminal justice. The College of Graduate and Continuing Studies oversees the university's graduate programs. The majority of the graduate programs are conducted on a distance learning platform. The university offers accredited and highly recognized programs in a range of fields including diplomacy, military history, history, business administration, civil engineering, justice administration, public administration, information assurance, education, nursing, and organizational leadership. Norwich offers 9 online graduate programs, including a combined 5-year Master of Architecture program, and, since 2001, a National Security Agency-sponsored Centers of Academic Excellence in Information Assurance Education. Norwich was ranked by U.S. News & World Report in 2014 at 74th in the Regional Universities (North) category. Norwich offers 20 varsity sports, including baseball, men's and women's basketball, men's and women's cross country, football, men's and women's ice hockey, men's and women's lacrosse, men's and women's rugby, men's and women's soccer, men's and women's swimming and diving, softball, men's tennis, wrestling, and women's volleyball. The Cadets compete at the NCAA Division III level and are affiliated in four conferences, mainly the Great Northeast Athletic Conference (GNAC) and the Eastern Collegiate Athletic Conference. The football team joined the New England Women's and Men's Athletic Conference in 2017. The college also has a number of student clubs for sports such as golf, paintball, fencing, horseback riding etc. The Cadets first fielded a football team in 1893. Among early notable moments is a 28-6 loss to Boston College at Fenway Park in 1914, the first college football game ever played at that venue. Overall, the program has appeared in 7 ECAC Bowl games (1984, 2003, 2004, 2010, 2012, 2013, 2014) and 2 NCAA Tournaments (2011, 2015). Norwich has produced 16 All-Americans, and has won or shared 4 Eastern Collegiate Football Conference (ECFC) Championships (2009, 2011, 2013 w/Gallaudet University, 2015). Six former Cadets have reached an NFL camp. Since the formation of the ECFC in 2009, Norwich leads the league in conference wins, overall wins, academic all-conference selections, and postseason appearances. Through the 2015 season, Norwich is one of a handful of teams who have reached the postseason 7 consecutive years. Norwich departed the ECFC in 2017 for the NEWMAC. The Cadets' home field is Sabine Field at Haynes Family Stadium. The field underwent a massive renovation for the 2013 season, transitioning from grass to turf, and adding lights for night contests. Since 2009, Norwich football is 28-8 at home (24-2 in conference games). Campus folklore includes a tale of a ghost of an old cavalry cadet who guards the gate to the stadium. Norwich's most prominent football rivals include Middlebury College, Castleton University, and the United States Coast Guard Academy. The series with Middlebury concluded after the 1991 season, after 99 contests, with the NESCAC's decision to eliminate non-conference football competition. Castleton founded their football program in 2009, and the Norwich game quickly became an intense rivalry. The Norwich/Coast Guard series (the Little Army/Navy Game) had been dormant after the 2005 game, but resumed again in 2017. Women's rugby has existed at Norwich since 1985 and gained a varsity status in 2008. They won the inaugural USA Rugby Collegiate Division II National Championship in the spring of 2012 and a USA Rugby Collegiate Division 1 National Sevens Title in the fall of 2011. Men's ice hockey is nationally ranked and had its 100th season in 2009–10. The program has won Eastern Collegiate Athletic Conference East hockey championships in the regular season every year from 1998–2016. They won the NCAA Division III Men's Ice Hockey Championship title in 2000, 2003, 2010, and 2017. In 2010, Norwich defeated St. Norbert College, 2–1, in double overtime. Overall, the program has reached the NCAA Division III Frozen Four 12 times. 2007–08 marked the first season of competition for the Norwich women's ice hockey program. A year later, the Cadets won their first-ever ECAC East conference championship and advanced to the NCAA Division III Women's Ice Hockey tournament. Norwich won the program's first NCAA Division III title in 2011. Women's lacrosse program gained varsity status in 2008. They have won 3 consecutive Great Northeast Athletic Conference Titles (2010, 2011, 2012), advancing to the NCAA Division III Tournament each time. Rifle team won the national intercollegiate rifle championship in 1916 and 1920. It is no longer a sport at the school. 138 graduates of Norwich University have served as general officers in the U.S. armed forces: 102 Army generals, 12 Air Force generals, 9 Marine Corps generals, and 16 Navy admirals. 26 graduates served as generals in foreign armies: 9 Royal Thai Army generals, 1 Royal Thai Air Force general, and 16 Republic of China Army generals. CommanderJames H. Ward (1823) – First Commandant of the United States Naval Academy; first Union Naval officer killed in action during the American Civil War. Gideon Welles (1826) – United States Secretary of the Navy from 1861–1869. Major GeneralWilliam Huntington Russell (1828) – Commander of Connecticut state militia during the American Civil War; founder of the Skull and Bones society at Yale University. CaptainGeorge Musalas "Colvos" Colvocoresses (1831) – Commanded USS Saratoga during the American Civil War. Major General Horatio G. Wright (attended 1834–1836) – Commander of the VI Corps of the Army of the Potomac during the American Civil War; Chief of Engineers for the Army; Chief Engineer for the completion of the Washington Monument. Major General Lewis Samuel Partridge (1838) – Nephew of Alden Partridge, Adjutant General of the Vermont Militia from 1852–1854. Brigadier General Thomas E. G. Ransom (attended 1848–1850) – general in the Union Army during the American Civil War. At various times, he commanded divisions of XIII, XVI and XVII Corps. Major General Grenville M. Dodge (1851) – Commander, Department of the Missouri; Chief Engineer of Union Pacific during construction of the Transcontinental Railroad. Dodge City, Kansas is named in his honor. Brigadier General Frederick W. Lander (1852) – Surveyor of railroad routes and wagon trails in the Far West; commanded a division in the Army of the Potomac during the American Civil War. Admiral of the Navy George Dewey (attended 1852–1854) – Commanded the Navy's Asiatic Squadron at the Battle of Manila Bay during the Spanish–American War. Brigadier General Henry Clay Wood (1856) – Received the Medal of Honor for Distinguished Gallantry at the Battle of Wilson’s Creek, Missouri, on August 10, 1861. Brigadier GeneralEdward Bancroft Williston (1856) – Received the Medal of Honor for heroism at Trevilian Station during the Civil War. Brigadier General Edmund Rice (1859) – Received the Medal of Honor for repelling Pickett's Charge at the Battle of Gettysburg. Brigadier General Robert H. Milroy (1843) – In command or present at the Union reverses of the Battle of McDowell, Battle of Cross Keys, and Battle of Second Winchester. ColonelThomas O. Seaver (1859) – Commanded the 3rd Vermont Infantry during the American Civil War; received the Medal of Honor for his heroism at Spotsylvania. Rear Admiral George A. Converse (1863) – Notable naval engineer; Chief of the Bureaus of Equipment, Ordnance, and Navigation. 1st LieutenantJames Porter (attended 1863–1864) – Officer in the 7th Cavalry from 1869 to 1876; killed at the Battle of the Little Bighorn. Rear Admiral George Partridge Colvocoresses (1866) – Commandant of Cadets at the United States Naval Academy at Annapolis from 1905–1909. Lieutenant GeneralEdward H. Brooks (1916) – Commander, VI Armored Corps, 1944–1945, during World War II; commanding general, U.S. Army in the Caribbean, 1947; commanding general, Second Army, 1951. Major General Leonard F. Wing Sr. (attended 1910–1914) – Commander, 43rd Infantry Division during World War II. Major General Ernest N. Harmon (attended 1914) – Commander, 1st Armored Division, 2nd Armored Division, and XXII Corps during World War II; commander, VI Corps. Twenty-second President of the University, 1950. Major General Briard Poland Johnson (1927) – Commander of 67th Armored Regiment during World War II; Chief of Staff for the Continental Army Command, Fort Monroe, Virginia, 1963. Major General Francis William Billado (1933) – Adjutant General of the Vermont National Guard from 1955 to 1966. Brigadier General Robert F. McDermott (attended 1937–1939) – Flew 61 combat missions during World War II in the European Theatre. In 1956 he was appointed Dean of Faculty to the Air Force Academy. In 1959 President Eisenhower appointed him the first Permanent Dean of Faculty and promoted him to Brigadier General. CaptainJames M. Burt (1939) – Received the Medal of Honor for heroism at Aachen during World War II. Major General Jonas Mansfield Platt (1940) – Participated in the assault landings of Guadalcanal, Tarawa, Kwajalein, and Peleliu during World War II. During the Korean War he Commanded 1st Battalion, 5th Marines. From 1958–1960 he Commanded the Marine Barracks in Washington, D.C. – the oldest Post in the Corps. Commanded the 6th Marine Regiment from 1961–1962. Commanded Task Force Delta in Vietnam from 1965–1966. Brigadier General Leonard F. Wing Jr. (1945) – Captured by Germans and held as Prisoner of War during World War II and successfully escaped. Later served as Commander of the 86th Armored Brigade. Major General Robert S. Holmes (1952) – Commanding General of the 91st Infantry Division in Fort Baker, Calif.
Brigadier General Charles E. Canedy (1953) – named to the Army Aviation Hall of Fame in 1995. Major General Donald E. Edwards (1959) – Adjutant General of the Vermont National Guard from 1981 to 1997. General Gordon R. Sullivan (1959) – Army Chief of Staff, 1991–1995. Major Ken Jacobs (1969) – Headed the creation of Task Force 160. Major General Stephen T. Rippe (1970) – Vice Director/Director of Management of the Joint Staff. Brigadier General Jeffrey P. Lyon (1972) – Chief of Staff of the Vermont Air National Guard from 1997 to 2002. Lieutenant General John C. Koziol (1976) – Deputy Under Secretary of Defense (Intelligence) for Joint and Coalition Warfighter Support. Lieutenant General Mark S. Bowman (1978) – Chief Information Officer (CIO) and J6 for the Pentagon Joint Staff. Lieutenant General David E. Quantock (1980) – Inspector General of the United States Army. Lieutenant General Bruce A. Litchfield (1981) – Commander of the Air Force Sustainment Center, Air Force Materiel Command, Tinker Air Force Base, Okla.
Brigadier General Steven J. Spano (1983) – Director of Communications, HQ Air Combat Command, Langley Air Force Base, VA.
Major General John J. Broadmeadow (1983) – Commanding General Marine Corps Logistics Command (LOGCOM). Lieutenant General Michael H. Shields (1984) – Director of Joint Improvised-Threat Defeat Agency (JIDA). Major General John W. Baker (1985) – Commanding General of the 7th Signal Command (United States). Major General Thomas A. Bussiere (1985) – Vice Deputy Director, for Nuclear, Homeland Defense, and Current Operations, Joint Staff, the Pentagon, Washington, D.C.
Brigadier General Michael J. Bouchard (1985) – Assistant Adjutant General for the Maine National Guard. Major General Gary W. Keefe (1986) – Adjutant General for the Massachusetts National Guard. Major General Mark J. O'Neil (1986) – Served in Army Special Operations at every level of leadership to include Troop Commander, Squadron Commander, and Regimental Commander. Colonel Michael S. Heimall (1987) – Director of Walter Reed National Military Medical Center. Brigadier General Raymond R. Descheneaux (1987) – Assistant Deputy Commandant for Aviation. Piloted 319 combat missions in Iraq, Kosovo, Burundi and Somalia in the KC-130, AH-1, UH-1, CH-46 and CH-53. Major General Cedric D. George (1987) – Deputy Director, Resource Integration, Deputy Chief of Staff for Logistics, Engineering and Force Protection, Headquarters U.S. Air Force, Washington, D.C.
Major General Thomas W. Geary (1988) – Assistant Deputy Chief of Staff, Intelligence, Surveillance and Reconnaissance, Headquarters U.S. Air Force, Washington, D.C.